For the temporary relief of minor aches and pains of the muscles and joints associated with strains, sprains, bruises & arthritis. 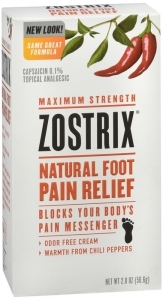 Zostrix® Foot Pain Relief Cream is a powerful medication containing the strength of capsaicin, the natural active component of chili peppers. For external use only. Do not apply to wounds or to damaged or irritated skin.